Area Plan concepts are general guides to indicate potential development options. Plans are schematic only, and the actual mix of land uses, locations and configurations of buildings, parking areas, streets and access points will be determined through the public review process for individual development proposals. Properties retain all existing rights. The Emerald/Perimeter Area is centrally located within the Emerald Corporate Business District along the Emerald Parkway corridor. This area plan was originally referred to as the Coffman Park Area Plan in previous versions of the Community Plan. 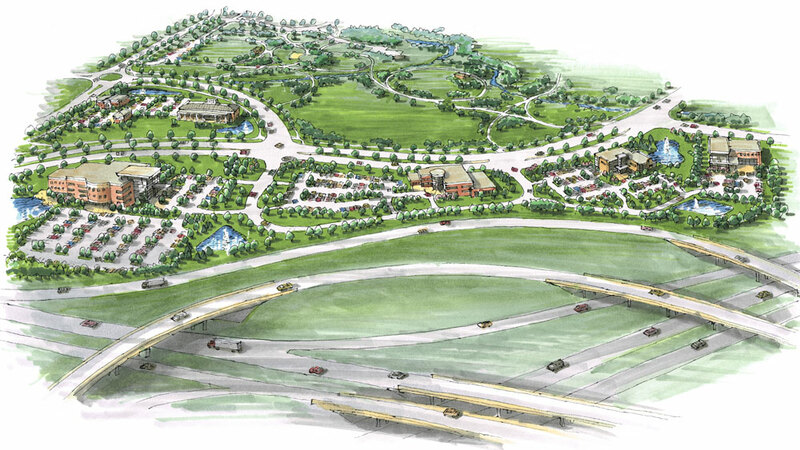 In 2010 the City entered into an Economic Development Agreement to facilitate corporate office development at the southwest corner of Emerald Parkway and Perimeter Drive, on land that had been planned as an expansion area for the park. The City has acquired additional properties and is now in the process of preparing a more detailed master plan for Coffman Park, focusing on land to the north of Perimeter Drive and west of Emerald Parkway, generally as depicted in this plan. The remainder of this area includes approximately 24 acres of relatively flat, undeveloped land located between Emerald Parkway and the I-270/U.S. 33 Interchange, providing significant development opportunity in a high-visibility portion of the City. Land within this area was rezoned for office development in 2011, and with a combination of excellent visibility and suitable access from Emerald Parkway, is now poised for development. Plans for future interchange improvements and acquisition of right-of-way should be considered as properties are developed. 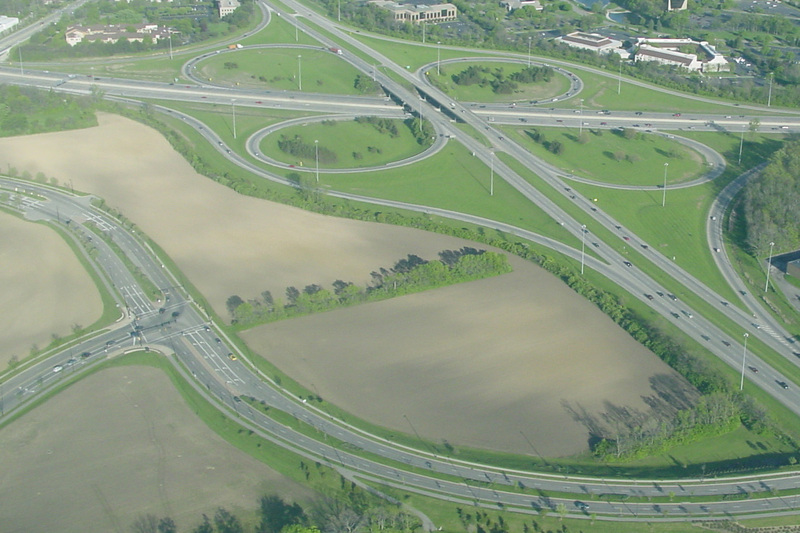 Flyover ramps and other elements in the interchange design may be a significant component of the site design process. High quality office uses should be sought that will provide street-oriented architecture, and parking that is adequately screened from Emerald Parkway. The majority of the land between Emerald Parkway and I-270 is under single ownership with established access points from Emerald Parkway. Three additional parcels of land located along Post Road and comprising approximately 3.5 acres offer additional development opportunity, but with significant access challenges due to traffic volumes on Post Road, topographic change related to the nearby I-270 overpass, and proximity to the intersection of Emerald Parkway and Post Road. Two of these parcels are owned by the City of Dublin and could be combined with adjacent land to create a new development site with excellent visibility from Post Road; however, direct vehicular access from Post Road should be discouraged to minimize traffic conflicts and maximize the street-orientation of new architecture. Opportunities for coordinated development and shared access with adjacent properties should be explored. The close proximity of Coffman Park requires special attention to pedestrian and bicycle mobility in this area. In 2010, Dublin’s first bicycle sharrow markings were added to Emerald Parkway in this portion of the corridor to enhance the traveling conditions for on-road cyclists. This improvement should be continually monitored to ensure safety and efficiency for cyclists and motorists alike. Off-street shared use paths along Emerald Parkway and Perimeter Drive offer additional options for a wider range of users and provide direct access to Coffman Park. As the centerpiece of Dublin’s larger greenway system, additional shared use path connections to and from Coffman Park should be explored to facilitate pedestrian and bicycle travel throughout the City. An existing portion of shared use path runs along the South Fork of the Indian Run beneath I-270; although currently disconnected from the larger path network, this segment provides an exceptional opportunity to integrate new greenways planned within the Bridge Street District into the City’s larger open space system. Opportunities to extend this path to Coffman Park should be explored, with sensitivity to the stream corridor and the nearby Willow Grove neighborhood. Future interchange improvements could also impact the existing I-270 stream crossing. The City should work with the Ohio Department of Transportation to ensure the greenway connection is maintained. …To encourage appropriately-sited, high quality office development along the I-270/U.S. 33 interchange area that maximizes development potential and to enhance an important greenway link within the city-wide open space system.